"This Fela Estate-approved anthology includes rare and previously unreleased music from Nigeria, Ghana, Colombia, Trinidad and more. He's best known by his first name, Fela. He's certainly Nigeria's most famous musical export. His name itself conjures images of 70s Lagos: a metropolis awash in the jubilation that swept in after the 1970 armistice in the civil war between the Nigerian Army and Eastern Biafran secessionists, a capital city in the midst of transition. This is the environment in which Fela and his Africa 70 popularized the hybrid of highlife, jazz and James Brown style, big-band funk he invented: Afro-Beat. In Nigeria, his countrymen knew his music like Americans know Elvis. On foreign shores, a chosen few Westerners could claim to know the extent of Fela's genius. As a result, while music historians have filled books with references to the influence of Westerners on Fela's creation, little has been said about Fela's inspiration on others. Thus, our compilation begins. Fela's music, and that of his organization inspired musicians across the global village when Afro-Beat was new and novel. 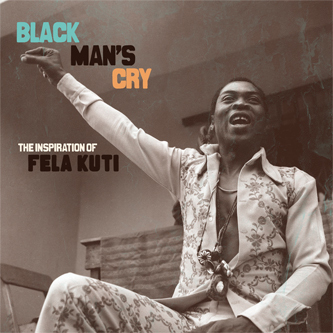 This compilation focuses on the music Fela inspired - whether by fellow Nigerians recording alongside him in the early 70s, neighbors in Ghana, then-modern Colombian cumbia ensembles inspired by the man who injected a new feel into the Yoruban rhythms that formed cumbia's base, Trinidadian steel bands or the select few organizations left that have maintained Fela's fury in the new millennium. This is but a cursory investigation into those inspired by Fela Kuti's genius, but it is unique: the first time that many of these tracks are not only offered a second chance for worthy introspection, but, in the case of many, the first time they're being issued full stop. Compiler Egon has written extensive liner notes and sourced never before seen Fela photos and other ephemera."